Freebitco.in already runs a hugely popular lottery whereby anyone claiming from its faucet is automatically entered into the Sunday draw. Prizes vary depending on how many additional tickets are bought and the prevailing price of bitcoin, but currently can reach around 1 bitcoin. There are also nine runners-up prizes as well. The new draw offers a set prize but runs in a similar way to the existing one; visitors earn two entries for every free faucet claim they make, one ticket for every roll their referrals make and 1 ticket for every roll they play on the site’s multiply BTC wagering game. You can buy additional tickets at the cost of two Satoshis each, so you can use your free faucet earnings to increase your chances without having to risk any of your own money. (A Satoshi is a tiny part of a bitcoin. 1 bitcoin = 100,000,000 Satoshis). 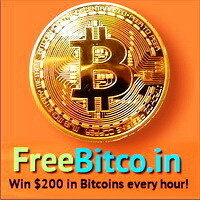 Freebitco.in is, as its name suggests, is completely free and there’s no requirement to spend any money on the site. You just need to open an account and then you can claim free bitcoin from the faucet. As we’ve already mentioned, your earnings can then be used to pay for other games on the site including the ‘Earn BTC’ which offers players the chance to gamble up their earnings. You can deposit bitcoin to play this game as well if you wish. There are other neat things the site offers as well, including a chance to win $25 in bitcoin every time your claim from the faucet, reward points for each claim which you can exchange for tech gadgets and the ability to earn interest on your balance. The latter is particularly appealing if you plan on holding onto you bitcoin. Freebitco.in pays an annual interest rate of 4.08% (compounded) on all balances over 30,000 Satoshi. You can either save up your faucet earnings or deposit bitcoin to take advantage of this. 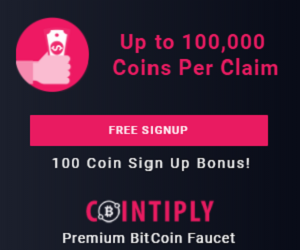 As with many faucets, there is a referral scheme in place but the beauty of this one is that not only do you earn when your referrals make a faucet claim, but also when they play the wagering game and when they earn interest on their balances. Freebitco.in has been around for a while now and this shows in their website design which could definitely do with a refresh. That said, it has a huge following and is known as a reliable, well-paying and completely legitimate site which offers many ways of earning free bitcoin. Payouts are made to the FaucetHub microwallet, so you’ll need to set up a free wallet there. And you can get a free bitcoin address from Coinbase, one of the largest cryptocurrency exchanges in the world. The withdrawal threshold is 30,000 which is quite high as faucets go, but unlike other faucets which come and go overnight, there’s no need to worry about holding your coins with this site. The new lottery is an excellent addition to an already top-notch free bitcoin earnings website. Let’s hope that they continue to innovate during the ‘bitcoin winter’ so they’re ready for the next boom.